Anywho I decided I had to make one. (NOT cause of the TV show) (which I haven't even seen) I just decided that life was too short to live without a giant round shield decorated with half of a space-wolf's head on your homemade weapons wall. Logically. Hey, it's my shield. If I want a Mandalorian wolf on it (the red stuff ain't paint by the way) then by golly it's gonna have the grandest half-wolf's head this side of Dathomir. This shield is unique to all the others i've seen made, as I am building it completely out of scraps I have laying around. (sound familiar? no?) The wood is pallets, the boss is a frying pan, the sheet metal I stole from my brother when he wasn't looking, and the strap was a demolished leather purse-thing from a flea market. Wow, now that I think about it, this sounds like the perfect entry for the Trash to Treasure challenge. (hint hint) What a coincidence eh? I have a YouTube channel. Every project is a an adventure. You should subscribe. Come on. Try, right now, to think of one reason not to subscribe. No, that reason doesn't count. Be reasonable. Can't think of anything? Huh. Thats funny. Neither can I. -2 feet or so of 2x2"
-Some sheet metal. (stolen from my brother) Aluminum, steel, or funny alloy in between whatevs it don't matter. Unfortunately I'm not sure of the gauge, but it was thin. Obviously, the thicker the material the harder it will be to work with. As usual, you could probably figure out a way to do it with less if you are both insane and have way too much time on your hands. My pallets had seen too much o' the great outdoors. When I tried busting them up with a hammer and pry bar they were too soft and only cracked, threatening to derail my project. So I resorted to the big guns and pulled out the sawzall, cutting each pallet down vertically between the slats, and then beat out sections holding them together. Then I let them dry out in the shop for a few weeks. If I was you, I'd use pallets that are already dry-ish. Pallets have a nasty habit of being imperfect junk boards that are only useful as shipping containers. To get rid of that all you probably need to do is just run them through a table saw real quick. Step 5: Layering. Glueing. Screwing. Screwing Up. So, my idea for this shield was to double layer the boards, one layer vertically stripped and the other horizontal. I then proceeded to glue-in-screw em up. Which....ended up being a bad idea. Actually in terms of mechanics it worked very well, but I did not realize that double layering the pallets would add SO much extra weight. The unique thing about a viking shield (historically) is that they were very large (average 36" in diameter), but were also very lightweight (for it's size). They accomplished this by being made of ONE layer of wood strips, held together by a few wood or metal cross braces. You would think that only being made of one layer of wood, they would be rather weak. Which was exactly the case. The smarty-pants norsemen combatted this by covering the fronts of the shields with leather or canvas, and edging them with iron or rawhide. Thus they were able to keep them relatively lightweight and still strong enough. Smartypants Jake thought he knew better than history and decided to double layer the pallets. Guess who now has a shield WAY too heavy to use? If you were to build one of these, I'd recommend a more traditional approach. Step 6: (Optional) Grind Off Bottoms of Screws. Because You Used Screws That Were Too Long. of Course. Drive a small nail (or screw if yo' a fancy pants) into the center of your new million pound board and attach a string (connected to a pencil) with a length equal to the radius of what you want the finished shield size to be. For a 36" shield, that would be an 18" string. (for the mathematically impaired) This allows you to draw a perfect circle the exact size you need. Then do the same for the inner circle. The size to make your inner circle will depend on the size of your boss, my frying pan was 8" in diameter, so I went with about 6 & 1/2" inner circle. Logically you need a certain amount of clearance so you have something to mount the boss to. You know what I write for self explanatory steps? Nothing. Cut to the length your heart desires, then make it look the way your mind's eye envisions it. Oh, and make it comfortable to hold. It still was a bit rough at this point, so before painting and staining I went over it once more with an orbital sander. Smooth as a baby's b*tt. Stain needs a sealer. I used some sort of spray seal coat. Probably polyurethane. The only black paint I had laying around was a flat black, which looked okay. Might just be me, but I think it would look just the tiniest bit better if the paint had a little sheen to it. If I were to do it again I'd probably go with a satin or eggshell. Whateva. Time to make it look more like one. Start by beating down the edges, to round them over. Then, to round out the bottom, go outside and beat on it on the dirt. The dirt will compact, allowing the metal to dome. I wasn't able to get it super round, but much better. Step 16: MAking It Look Purty. Grab you some sandpaper and work out all those hammer marks. I also used a wire wheel. For some reason I had trouble coming up with an original design for the design on my shield face. (I normally am artistic enough) Thus, the only thing to do was steal someone else's original idea. 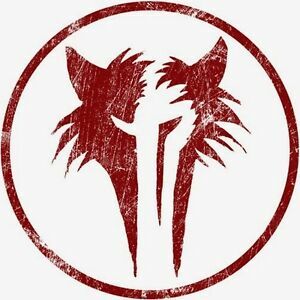 I found this sweet half wolf half Mandalorian design on google images. BOOM! Perfecto! Using that as my reference, I drew the outline of the space-wolf onto the shield. Then I began painting. Be forewarned, this process takes anywhere from 2-6 years, not counting coffee breaks. I really love the look of shields with a metal banded edge. They look, to me at least, EPICAMOSO. Obviously, I just had to do it on my shield. The process is fairly straightforward, though it is time consuming. First, you want to cut the sheet metal into strips. I cut mine into strips 3" wide, which was enough for the roughly 1" thick edge, leaving an inch overlap on either side. (if you do only 1 layer of wood, you will need to fudge the measurements) Then, you need to make a mark every four inches down the length of the strip. At each mark, make two cuts a third of the way through the metal, one cut on each side. (I didn't make all the cuts at the beginning, but as I worked along the edge) This gives you the joints where you will bend the metal. I found it best to do it by attaching the end of the strip onto the face of the shield, bend the first section to the curve, and then bend the flap over onto the face. I used a hammer to crease the metal well, and then pilot holed and screwed it down. Two screws in each "flap". I am well aware that my description just destroyed any amount of clarity you may have thought you possessed upon first seeing this step. Apologies, my dear sir. See pictures to slightly lesson any confusion I may have caused. Thank you. Drill some holes, (i did five evenly spaced around the diameter) then screw him down. Oh yeah! Buuuuuuuuuuuuuuuuuuuuuuuuuuuuuuut, my shield was far too heavy to call it "historically accurate", and any advantage gained by leaving it a traditional center-grip was lost. So I decided to add a strap, cause it would make it easier to wield that 20lb monster. Oh, you hadn't heard? Yes, my shield weighs 20lbs. I actually even cut it down a few inches, rather than the 36" diameter shield I had planned, I chopped it down to 32", to try and minimize the weight as much as I could. Ha! Nope, still weighs a metric ton. Really cool, I love it! it looks pretty real, too! I am a direct descendant of the Viking king Ragnor Lothbok, I just might make one to hang on my wall. You write how people think. I love it. Thank you, and keep making instructables!!! I decided once that it was dumb to write stuff that was boring. Thanks :) I most certainly will! If you want it in the trash to treasure contest, you should enter it, cause right now it is not. I entered it, but apparently it hasn't registered the entry yet. Annoying. Well thanks for the vote! Appreciate it. Yeah, I think it's taking a while because its a weekend. I don't think the editors work on the weekend. It'll probably get entered tommorow. Dang, that'd be the best coffee table ever. You could use a warhammer or mace as a table leg...I dunno how, but it'd be awesome. Fantastic build, my dear somewhat-obsessed-with-building-weapons friend! Only "somewhat"? My dear Brokk, I am positively offended. your humor shows through, and makes this instructable hilarious. I would do it if I had money, (I'm in high school, and all high schoolers are broke) but I am keeping it in my big list of favorites to do at some later time. Really great Jake. "all high schoolers are broke" Lol, tell me about it :) Fortunately for me I had all the materials already, so it didn't cost me a dime.